I teach a weekly class on Tuesdays. This is in Brigsteer near Kendal. Classes are held on Tuesday mornings, starting at 10am, till 12 noon. We have a 15 minute break for convivial refreshments. Open to all, the class is held at the beautiful Brigsteer Hall, LA8 8AL. ​The Hall was opened in 2010. It is light and airy , and there is plenty of room for free parking. Newcomers are most welcome, so drop by to see if it is for you! There will be Thirteen classes for £75, for payment at the start of term, or else £7 for those who prefer to pay for one session at a time. We are going to have a particularly special class to welcome the Spring on Tuesday 26 March when we welcome Jeanette Whitford from Glastonbury, with Returning to Light. ​We will meet from 10 till 2 and enjoy a shared lunch together as well. "Thanks Miggy. 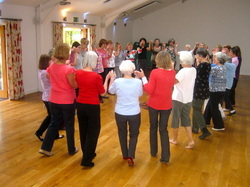 You do invest so much energy into our Tuesdays ... thoroughly enjoyable"